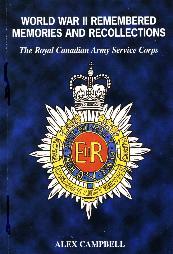 "This is not intended to be a history of the Royal Canadian Army Service Corps but a small collection of short stories of the recollections and experiences of a representative group of former members of the Corps. In many ways it is unfortunate that we have waited so long to compile this volume as all to many of the would-be contributors have passed on and accordingly their wartime memories have gone with them. The contributors to this volume to be known as "World War II Remembered" have almost entirely avoided the elements of death, damage and destruction associated with World War II and have turned their thoughts back to the people they met and to the more personal side of their days in Canada, England, Italy and North-West Europe. Time and the years have taken their toll on many of our surviving WWII Officers and we regret that a great number of them have been unable to participate in this publication"
Price $45.00 CDN, includes postage & handling. Price $30.00 US, includes postage & handling.